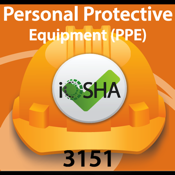 The iOSHA 3151 e-Publication - app provides Health, Safety and Environmental professionals (HS&E) access to the Occupational Safety and Health Administration's Personal Protective Equipment information using their iOS device. Whether in the field or in a meeting, view the latest information from OSHA.gov RSS Feeds, along with safety regulations and letters of interpretation quickly and easily. • The ability to place a call, text or create a contact for later retrieval from listed telephone numbers on the iPhone. On the iPad, a contact can be created or the number appended to an existing contact for retrieval and placing a call through a third-party app.